Martini waterfront suites in Fiskardo, consist of 3 one bedroom suites ideal for couples. The property is situated in a natural green enviroment just above the coast.The three suites have balconies with uninterupted views of a stunning scenery consisting of the entrance of the port of Fiskardo, Ithaka and Lefkada further in the North.The pool is very comfortable (11x5) and has a terrace around it for relaxation . Within a 5 minutes walk is the nearest beach and seven minutes walk takes you to the Fiscardo harbour. It is also possible to swim just in front of the villas in the seashore with the crystal clear water. Fiskardo is located in the Northern part of Kefalonia in Erissos. It is surrounded by dense forests of cypress trees that reach down to the crystal clear water . When you visit Fiskardo you can understand why this picturesque fishing village has become a "compulsory" stop for the yachting people sailing the Ionian. In the ancient times Fiskardo was called Panormos. On recent excavations a small theater and a big tomb were discovered and one can see them as they are near the centre of the village. Fiskardo is protected by the Greek government in order to conserve its Venetian architecture.The harbour is surrounded by Venetian style houses that are well maintained. In the winter and early spring, the area is very quiet ideal for nature lovers and a great time to go fishing. In the summer time the quiet village is transformed into a cosmopolitan port with yachts and sailing boats. There are many restaurants ,cafes , bars, souvenir and clothes shops, boat rental facilities, scuba diving center in Fiskardo that attract the holidaymakers of the surrounding areas as well as the folk from the yachts. The area is very quiet ideal for nature lovers, there are several hiking trails that start from here (check this link for more info). The Venetian Lighthouse and the Byzantine Basilica can be admired from the properties and reached on foot on a beautiful walk on the other side of the harbor. Beautiful beaches like Emblissi , Dafnoudi, and Alaties are just a few km away. A great advantage of our suites in Fiskardo is that they are only a 600 meters from the port of Fiscardo and yet they are completely isolated from the crowd within a green natural Mediterranean environment. Martinis suite villas in Fiskardo is a unique blending of unspoiled natural enviroment and proximity to the village of Fiskardo and the beach of Foki.The suites are situated blending with the natural eniroment and offering breathtaking views. Special attention has been given to the choice of comfortable beds and very good quality matresses offering very comfortable sleep. The property is situated in a natural green environment just above the coast. The three suites have patios with uninterrupted views of a stunning scenery consisting of breathtaking sea views, the entrance of the port of Fiskardo, neighbouring Ithaka island and Lefkas island further in the North. The properties share a spacious outdoor area with terrace, pool, sunbeds and umbrellas, ideal for relaxation. The views from every part of this properties and land is unique! Within a 5 minutes walk is the nearest beach and seven minutes walk takes you to the Fiskardo cosmopolitan village and harbour. You can also walk down and have a swim just in front of the villas with the crystal clear water. The suites are offered this year at special prices. Our houskeeper Lena can prepare traditional Greek dishes to our guests . Excellent property, clean and well maintained. Perfect location. harbour. Helena and Nicklas were extremely welcoming and attentive to our needs. We shall certainly return. We are all looking forward to your next trip to us!!! 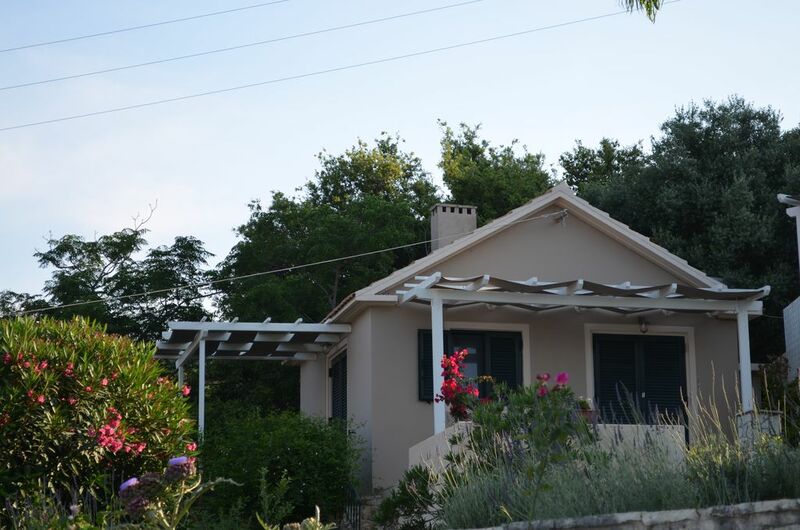 Peaceful location with fantastic views and within easy walking distance of tavernas and shops. This was our 6th visit to Martinis. Nikolas and Lena made us feel extremely welcome as usual, as did the local people in Fiscardo. Had a splendid time lounging by the pool, watching the boats entering and leaving the harbour and eating fantastic (inexpensive) meals in the local tavernas. The property has been refurbished tastefully, but perhaps the kitchen and bathroom fittings could do with sprucing up next. Dear Malcolm thank you for the review and the recommendation that we are considering as very useful. We arrived only to find that the property we had booked had been let (by Demitri - the owner) directly to someone else bypassing HomeAway. Luckily the middle unit (No 2) was free so we had no option but to take it. Unit 2 is smaller and has no bath (shower only) something my wife really needs due to various replacement joints. Lena (the caretaker and owner's representative) was most helpful and considerate. Never the less we spent the week in less than ideal conditions. The actual location, pool and surroundings are fabulous and the friendliness of Lena and her husband Nicolas could not have been bettered. Demitri, came to see us and conceded that he had made a mistake and we amicably negotiated a refund. However the disappointing thing was HomeAway's refusal to help and their insistance of hiding behing the small print in their Terms and Conditions. It is not apparent from their booking website that, although you pay the money to them, they are only a marketing facility and absolve themselves of any further liabilities (contract = agreement + consideration?). Beautiful accommodation, a warm welcome and helpful hosts. Dear Malcolm , thank you for your review , it is great to know that you enjoyed your stay and we hope to see you again! Small suite with all that's required for a couple looking for a quiet getaway in Kefalonia. Three suites of different sizes, set above the quiet main road, with amazing views. Check out which would suit best when booking. Fantastic pool and surrounding area. Slow ten minute walk into Fiscardo, plenty to see on the way. We were looked after so well by Elena and Nickolas who I have to say went above and beyond to make our stay amazing. Martinis waterfront suites in Fiscardo, consist of 3 one bedroom suites ideal for couples. The property is situated in a natural green enviroment just above the coast.The three suites have balconies with uninterupted views of a stunning scenery consisting of the entrance of the port of Fiskardo, Ithaka and Lefkada further in the North.The pool is very comfortable (11x5) and has a terrace arround it that offers abudant space for relax . Within a 5 minutes walk is the nearest beach and seven minutes walk takes you to the Fiscardo harbour. Fiskardo is located in the Northern part of Kefalonia in Erissos. It is surrounded by dense forests of cypress trees that reach down to the crystal clear water . When you visit Fiscardo you can understand why this picturesque fishing village has become a "compulsory" stop for the yachting people sailing the Ionian. In the winter and early spring, the area is very quiet ideal for nature-loving people and a great time to go fishing. In the summer time the quiet village is transformed into a busy port crowded with yachts and sailing boats. There are many restaurants ,cafes and other shops in Fiskardo that attract the holidaymakers of the surrounding areas as well as the folk from the yachts. A great advantage of our suites in Fiskardo is that they are only a 600 meters from the port of Fiscardo and yet they are completely isolated from the crowd within a green natural Mediteranean enviroment. Prepayment is 80% refunded for cancellations at least 150 days before arrival. For cancelations made later than the prementioned period of 150 days there is refund of 10%.